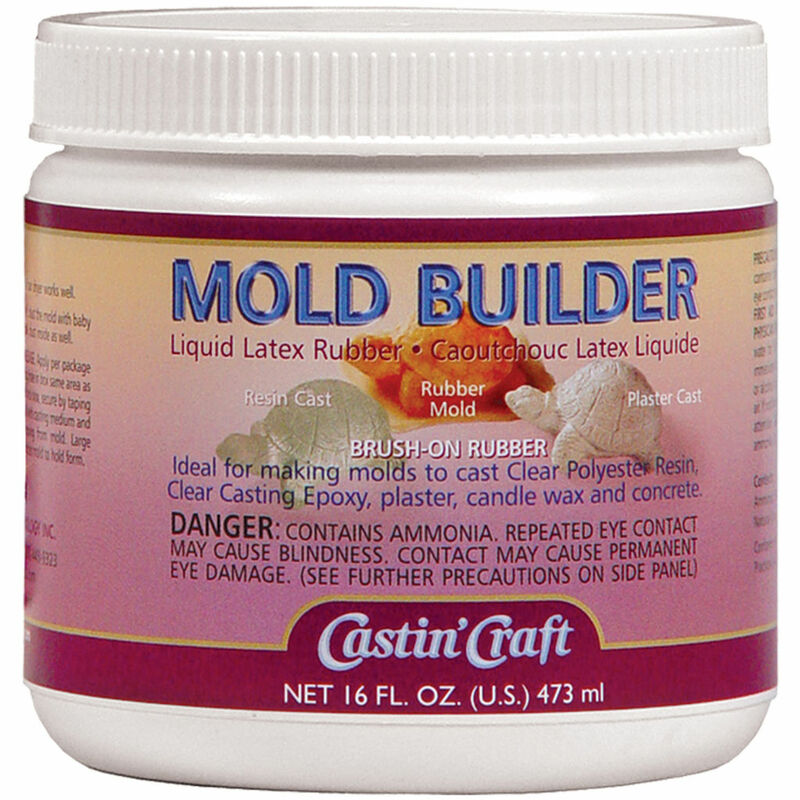 Mold Builder by Castin’ Craft is a liquid latex rubber mold-making compound readily available online and at major craft stores. I’ve been using Mold Builder for years now, and I think I’ve finally mastered it. The more I use it, the more I like it. It’s a reasonably-priced product with a wide range of possible uses. In order to create a mold, you can sculpt the original, or use something existing you want to make a mold from. I find it works well with Plasticine, most hard plastics, glass, metal, polished wood and seashells (among other things!). It takes a very detailed imprint. You just paint on Mold Builder, let each layer dry completely, then paint another layer. I find between 5-10 coats is sufficient for most smaller pieces. The more coats you do, the harder and less flexible the mold will be. 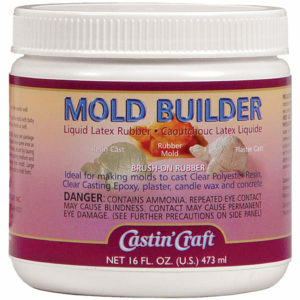 I find Mold Builder works best with small plaster castings. For larger pieces, or pieces that don’t have a wide, flat bottom, it will usually need some kind of support or platform. It’s really flexible, but that means the heavier your casting material (like plaster), the more important a good support becomes. Without a good support, you may end up with a deformed casting at best, or a sloppy mess on your floor at worst! I make supports in a variety of ways. In some cases, the original can become a support. I have a small traffic cone and a pyramid-shaped candy container I made molds from, and I use the originals now as a support. I had to cut the cone though, in order to get the casting out. So I’m going to try doing a two-part plaster support. You can also use Plasticine, clay, sticky foam balls, sand, plaster or resin to make supports. 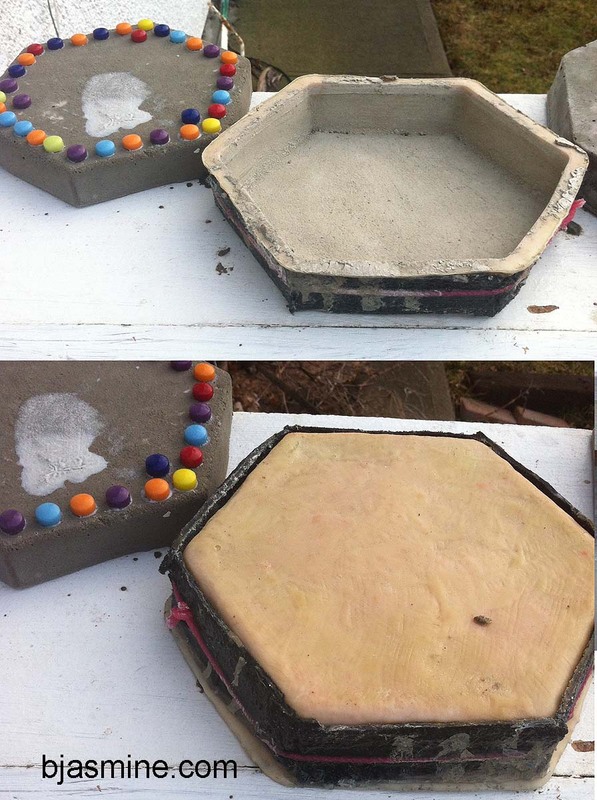 The small rock molds on the left have plaster supports. The large one near the bottom was done free-hand, with thick plaster on a silicone mat. 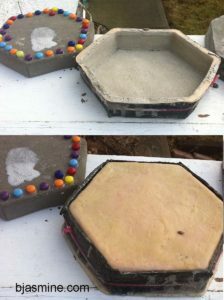 The square-shaped supports were done using Lego forms or small boxes to create a well. Lego is a must-have tool for a model maker! You can create wells the exact size you need. I de-mold the original first, then press the empty mold into the wet plaster, using my fingers to get the mold into the right shape. If you don’t take out your original first, you may find it hard to de-mold. You can also reinforce your larger molds with bandage gauze. I haven’t tried this yet, but I have some larger projects I may test it out on. I would give several coats before using the gauze, just to be sure I got a nice imprint, and work in small patches so the mold doesn’t deform while things are setting. The one-part support on the right, for a large stepping stone mold, was made from resin. It is shown from the top and bottom. I cut strips of felt, and dipped them in resin, painting two extra coats on to fill in open areas. It was messy, and when I first did this, the resin support had a base, but I found that it was difficult to remove, so I cut out the base with a Dremel tool. You may have to experiment with different pieces to discover what kind of support works best for you. This two-part support on the left was made from plaster. I made one half free-form, then let it set. I used carpenter’s tape to coat the open edge, then laid down the second coating of plaster. I keep the two sides together with rubber bands, and use a disposable cup to hold everything upright (I hope to provide a video tutorial when I get a chance). I have heard that you can use Vaseline instead of the tape. I’m going to try that, and will update this post when I do, Taping the support was a bit of a challenge. 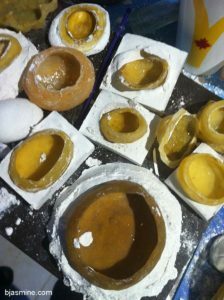 It is best to let your finished mold dry out for a while before using it, especially if you are using resin. If you are just doing a quick prototype, it will be sufficient for resin, but doesn’t give the nice perfect smoothness of Castin’ Craft’s Easy Mold Silicon Rubber (which I also enthusiastically recommend). I LOVE the “blue goo” as I call it, but it’s pricey. I only use the blue goo for projects that I know I will use a lot. 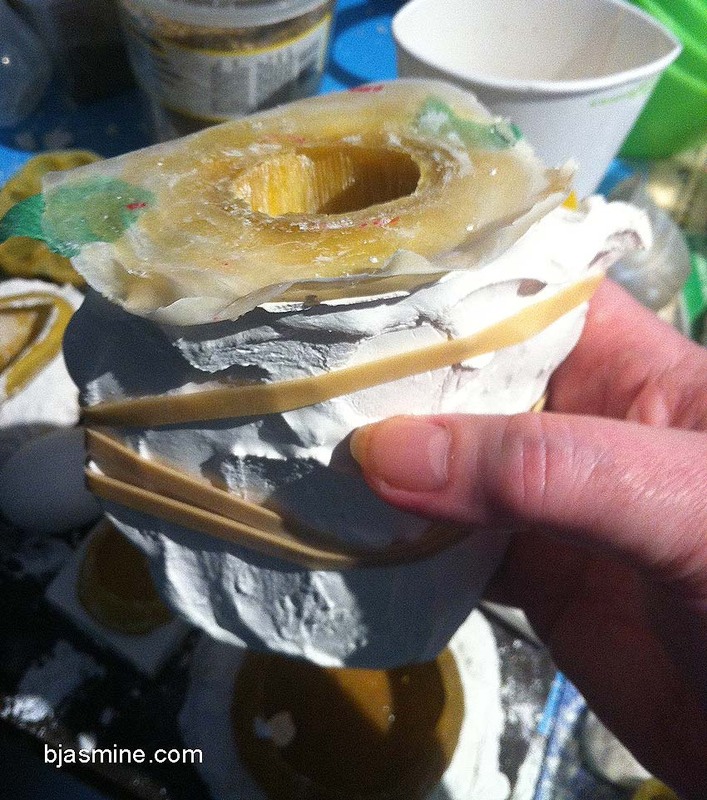 Let the mold dry out between castings too, especially if it is a larger plaster piece. Some of the moisture from the plaster will leech into the mold, and you’ll want it dry and fresh before doing another cast. Downside: Mold Builder smells like ammonia. But I am “scent-sitive”. It’s not overwhelmingly strong, though. It can develop mold-like spots over time. Upside: More affordable than many alternatives. Easy to use. Water-based cleanup. Really flexible molds. I use mold builder as a resist in my watercolor and acrylic paintings. It appears to be exactly the same compound as commercial paint resists, but is thicker. You can water it down with tap water if you like the consistency of commercial paint resist products, but I actually prefer it as it is. Much easier to remove, and works perfectly. I have found it works slightly better on acrylics if you let them dry first, you might get the odd smudge if you remove it too quickly. Stamp making. I have made small stamps for my resin and plaster projects. There are a number of ways you can do this. For my plaster stamps, I carve the design into Plasticine, then fill up the cavity with Mold Builder. I use a small cutting from a discarded mold as a little handle. You could do the same with more intricate patterns in wood or linocut, then glue the resulting stamp to a block of wood for support. You can use it as a coating to protect electronics. According to Castin’ Craft, Mold Builder is a natural non-conductive rubber, it should work just fine as an insulator/wire coating. So if you are embedding LEDs into a sculpture and you want to protect your electronics from the elements, you can coat them with Mold Builder. Cut up and save any molds you are not using, cut off any extra flashings. You can use these bits and pieces to reinforce the base of a mold that needs support, or use them as filler for wider empty areas. Mold Builder won’t stick to most things, that’s part of the point of it … but as a temporary emergency patch for a leaky boot or sink it would be perfect! I can think of quite a few uses for it around the house to stop assorted leaks. Review: Outdoor Gloss Lacquers/Varnishes	What is Orgonite?